Lauren explained that this tattoo is a "conceptual representation" her son Dylan. The name Dylan means "from the sea." 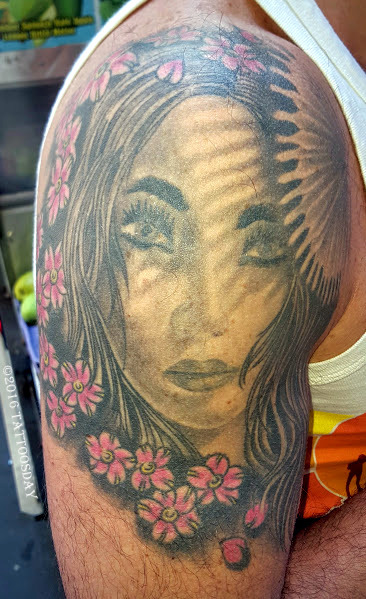 She had this done at the Wildwood Tattoo Beach Bash by artist Jake Punzalan (@jakepunz), who is the owner-operator of Veritas Tattoo (@veritas_tattoo) in Hartford, Connecticut. 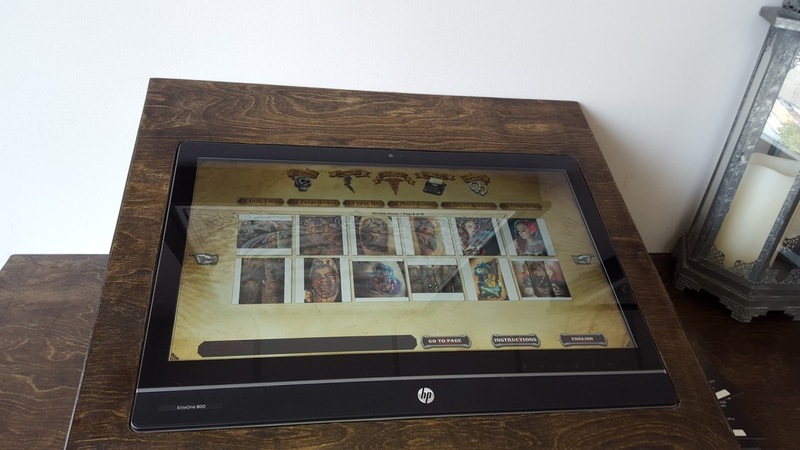 Incidentally, Lauren (@laurenhadams) is a photographer, whose work can be seen here. Thanks to Lauren for sharing her tattoo with us here on Tattoosday! 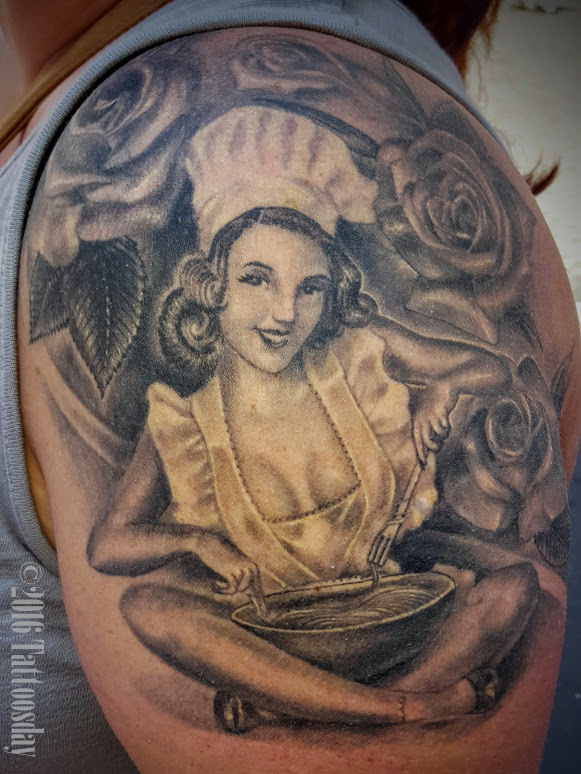 Nina explained, "It's a pin-up chef girl, because I own a restaurant ... Johnny D's in Vero Beach, Florida ... I got the roses added on later." She credited Isaac Serrano (@tattooartbyisaac), formerly of Scooter's Skin Art in Vero Beach, Florida. 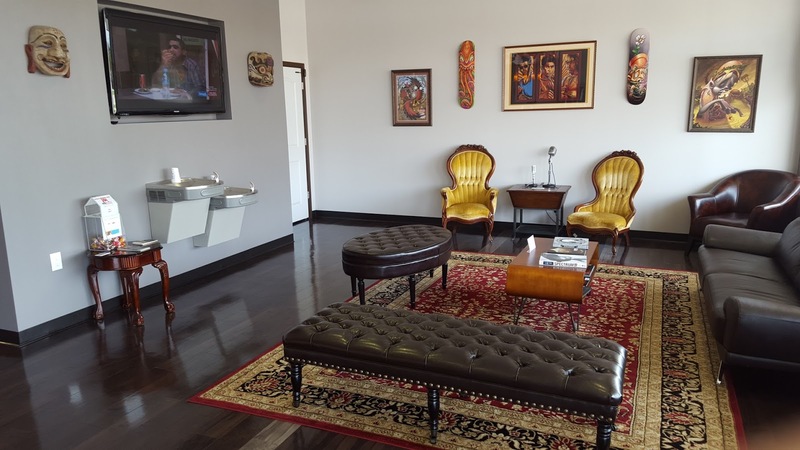 He has since moved on to Gypsie Soul Tattoo (@gypsie_soultattooslc) in Salt Lake City. Thanks to Nina for sharing this great pin-up tattoo with us here on Tattoosday! I met Melanie last week on the subway platform at Broad Street. She had a couple really cool tattoos that she let me snap photos of, and she filled me in later on the details. "The truth is, I have always had an obsession with owls. There is something about their quiet wisdom that intrigued me. They possess secrets and messages that are meant to be told to the right person at the right time. When my father passed, I was always searching for something, for answers. My dad had all the answers and life lessons for everything. Maybe that is why I identify with owls; because in some way, they remind me of my dad; wise with hidden knowledge. I wouldn’t say I wasn’t that young when my father died, I was 24, but I still had a lot of learning and growing up to do. I was lost for a long time and would go on random walks to think, search for things that would fill a void that was left in my life. One night, I was walking down the street when I looked up in the darkness of a tall tree and all I could see was the bright eyes on an owl. At that moment, I felt as if the owl was staring right at me and calming me in a way that my father would; making me feel as if every thing is going to be ok because he will always be there to protect me. So I decided, for protection, for wisdom, for life lessons, I could keep my wise owl close to me on my shoulder." "Art always gave me an outlet to express my feelings. If I felt depressed or broken, happy or loved, I would sketch, draw or paint. I never had a good way with words, but I could express feelings and things dear to my heart with art." Both tattoos were done by Matt Huff (@matthufftattoo) from Brooklyn Ink (@OriginalBrooklynInk) in Bay Ridge. Work from Matt has appeared on Tattoosday previously here, and art from the shop has been featured numerous times over the years,as evidenced here. Thanks to Melanie for sharing these cool tattoos with us here on Tattoosday! I learned this weekend, through social media, that Cody Todd had passed away. Not many people may have heard of Cody. As far as I can tell, he published only one title. But he was much loved by those that knew him. We met virtually, through the ether, back when I was assembling the first group of tattooed poets for the Tattooed Poets Project. And, a year later, he sent me more work, which appeared in 2010. Whether or not the contributors feel it, I regard Tattoosday's ledger of poets (287 and counting) as comrades and friends. 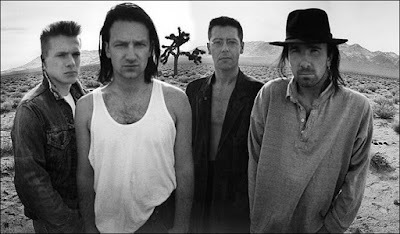 They have opened up to me and, when one of them leaves us, I feel like I've lost a friend. In that spirit, then, do I offer up a composite of Cody's contributions. These appeared on April 22, 2009, and May 1, 2010, respectively, back when I was cross-posting the poems on my old site, BillyBlog. and the thief and priest abides. in the back. Mute tombs kicked in half. I’d barter light for a necklace of dried eyeballs. Hell, I’ll trade in that hot-spurred devil himself. Watercolor paintings on the refrigerator. Watercolor painting of dinner on my plate. The eyes were flashlights and black holes. Mainly, laughter was swept gravel in the street drain. destroying two heads of glass. a miniature tornado atop my wrist. it is a currency between thought and motion. Cody Todd is the author of To Frankenstein, My Father (2007, Proem Press). His poems have appeared in Hunger Mountain, Faultline, Bat City Review, Salt Hill, The Pedestal and are forthcoming in the Konundrum Engine Literary Review the Columbia Review and the Georgetown Review. He was born and raised in Denver and received an MFA from Western Michigan University. He currently lives in Los Angeles and is a Virginia Middleton Fellow in the PhD program in English-Literature/Creative Writing at the University of Southern California. In 2010, we extended the Tattooed Poets Project into May. On May 1, we announced that we are being visited by an old friend, Cody Todd, whose tattoos appeared here last year. Not too much of a story behind this. It is Marv and Goldie from the "The Hard Goodbye" of Frank Miller's Sin City. The artist who did this is from Tokyo, and her name is Koko Ainai. I admire the precision of her work in copying Miller's extremely elaborate sketching. As Marv and Goldie embrace, he is holding a gun he apparently took away from her and a bullet hole is smoldering in his right shoulder as he lifts her off the ground. That tattoo is the first of what is going to be a kind of sleeve in parts in which I take different scenes from noir films or works and decorate my whole left arm with. Upon seeing Farewell My Lovely with my girlfriend last week, I decided to get the front end of a 1934 or 1936 Buick as my next tattoo. 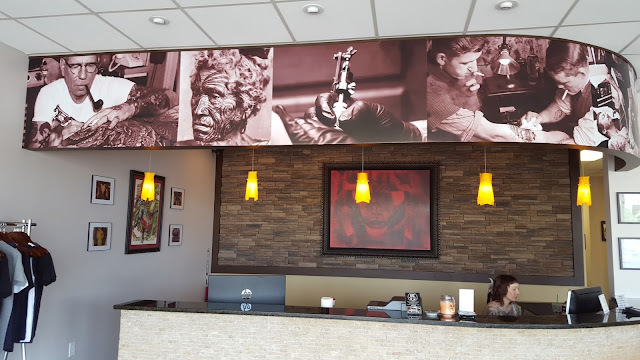 ...I am doing my critical work for my PhD at USC on the "western noir," which is a term I sort of coined for a specific genre of film and literature concerned with elements that typically comprise classical film noir, except they take place in cities in the western part of the United States. As we see in the film, Sin City, it has a "Gothic City" feel to it, but it is most certainly somewhere out in western Nevada, or California. I think the motifs of lawlessness, street and vigilante justice, and the disillusionment with the American Dream are all at work in this kind of genre, and that it also borrows many elements from the Western as a genre as well. If anyone wants to read good literary western noir, I would direct them, promptly, to read Daniel Woodrell, who takes the noir theme and brings it to the Ozarks and southwest Missouri. If Chandler and Faulkner had a love-child, it most certainly would be Woodrell. "Sadly, I don't have any noir poems. I'd love one to explore a relationship between noir and poetry, even though I doubt it is possible. The early work of Larry Levis is noir-ish (e.g. "L.A. Loiterings" or "Fish") but I don't think it was his conceit to explore that relationship, even if it exists. The work of Bukowski, voluminous as it may be, comes from a kind of noir persona that the poet created for himself, but again, not really an attempt to explore the poetics, if any exist, of noir. I do have a weird poem here that I wrote in a woman's persona, and she came to me one night as a rather desperate and dark soul." to be refreshed after each glass. Don’t leave me alone, portrait. admiring the stars, wanting to eat the their own cold smiles. Reading back on these old posts, I marvel at how interesting Cody's discussion of his tattoos were. Not everyone is as expressive with their contributions. Cody Todd will be missed, in more ways that I can even fathom, I would guess. We never met, and hadn't spoken in years. Still, his loss seems deeply tragic. This is the best way I can pay tribute to one of our contributors, one thread in the fabric that makes Tattoosday and the Tattooed Poets Project. Farewell, Cody, on behalf of the Tattoosday community. Condolences to your friends, loved ones, and family. This entry is ©2009, 2010, 2016 Tattoosday. 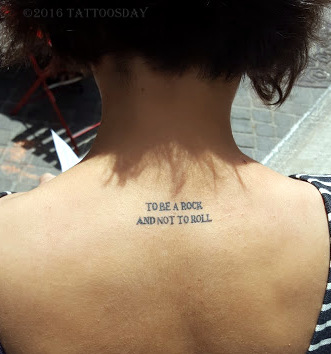 The poems and tattoos were reprinted with the poet's permission. As we approach our ninth anniversary in a little over a month, I look at Tattoosday not only as an outlet to express my admiration of tattoos, but as a finder of occasional friends. Over the years, this little blog has brought me its share of friends and acquaintances. Take one example, a woman named Liz, who I first met in August 2010, on the West 4th Street subway platform. Her tattoo appeared a month later here. I can't say why we became social media friends, but our paths crossed again in May 2011, when we both showed up for a taping of NY Ink (recounted here). Liz got to hang out as an extra in the background of an episode, and I was one of the lucky folks who got a rooster tattoo. I hadn't seen Liz since then, except on Facebook, as we occasionally traded messages. Liz credited this cool anatomical heart on her arm to Danny Boy Smith at Let it Bleed Tattoo Parlour in San Francisco. Thanks to Liz for sharing her tattoo with us here on Tattoosday! Earlier this week I met Tanya outside of Bowling Green in lower Manhattan. Tanya told me this was done by a friend of hers in Slovenia. "No big story," she told me. Thanks to Tanya for sharing this with us here on Tattoosday! 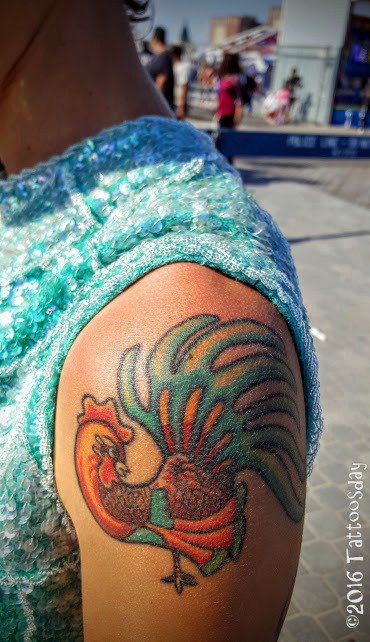 Full disclosure, having a rooster tattoo myself, I have a tendency to like other people's as well. Christina explained that her grandmother collected roosters, so this drawing she did is an homage to her. She credited Derek Mullins from Metamorph Tattoo Studios (@metamorphtattoo) in Chicago. You can see some of Christina's own artwork on her website here. Thanks to Christina for sharing her rooster with us here on Tattoosday! She credited this work to Jay Joree (@jayjoree) from Last Angels Tattoos (@lastangelstattoos) in Dallas. She told me, "I'm just a crazy cat lady and I really like cats." She added "I like the idea of having a Gentleman Cat." She plans on getting a complementary Lady Cat on the other side of her forearm. 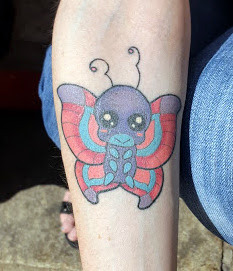 Thanks, Amanda, for sharing this cool tattoo with us here on Tattoosday! 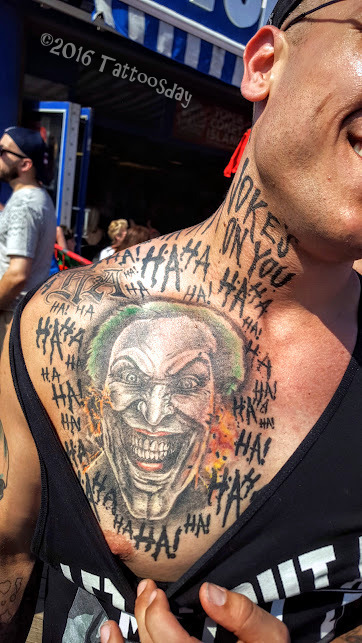 Thanks to Mikey for sharing this amazing tattoo of the Joker, with all the Ha Ha Ha's screaming off of his skin. He credited Albie (@riseghostofwar) at 223 Tat-2 (formerly Peter Tat-2) in West Hempstead, New York, and said he still has one session to go. Thanks Mikey for sharing your work! 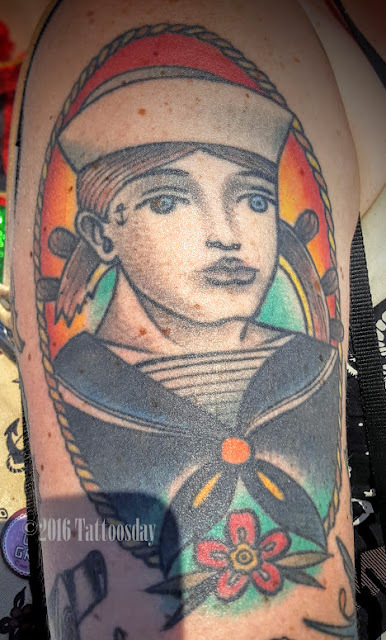 I was in tattoo heaven at the Coney Island Mermaid Parade (@mermaidparade) yesterday. I could literally fill this site for a year with all the body art bared on the boardwalk. This year followed the same pattern as the last, however. I hung back and enjoyed the spectacle, talking to a few people, and only really started wearing the Tattoosday hat later in the day. When people are parading, they're not as likely to take the time to share as they are afterwards. The end result is perhaps a half dozen tattoos to share, but ones that I really like from cool people. 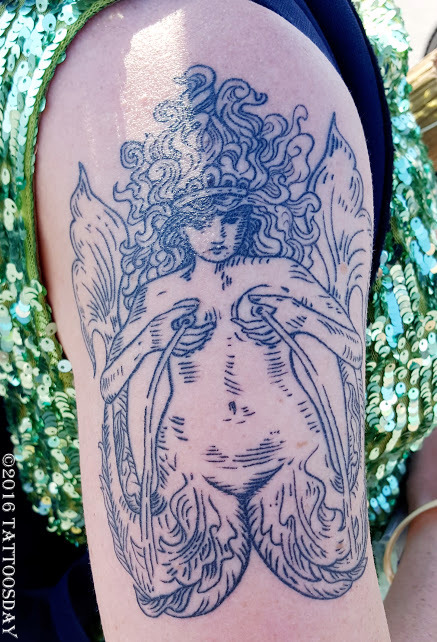 Briana explained that the mermaid illustration upon which this tattoo is based came from an old alchemical text and that it is, historically, one of the first recorded mermaid drawings. Check out this reference for further detail. Briana also pointed out that the mermaid is lactating and, in essence, feeding the world. I particularly love this tattoo because of its linework and that it is not typical of your normal color mermaid tattoos. Brianna credited the work to Kat Fedora (@katfedora) from Bang Bang Body Arts (@bangbangbodyarts) in Northampton, Massachusetts. Thanks to Brianna (and all the other cool people) for sharing this awesome tattoo with us here on Tattoosday! Last August, I was in Virginia Beach, visiting family, and I decided to swing by a couple of tattoo shops. I mentioned Ghost Ship here, and I also swung by Red 5 Tattoo. The shop was bright big and spacious and I snapped a few photos. However, before I share those, Alicia, one of the shop staff working when I walked in was kind enough to share this pretty fantastic U2 tattoo that hearkens back to the cover photos from the band's Joshua Tree album. 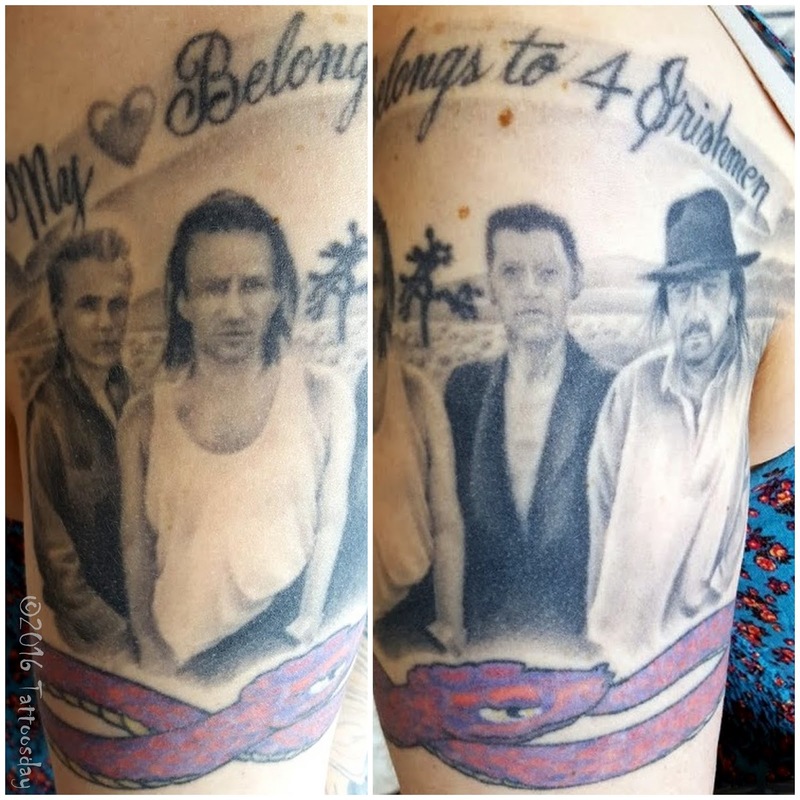 It's pretty self explanatory, with the message “My ❤ belongs to 4 Irishmen” alluding to U2’s country of origin. The recording of my interview with Alicia was deleted, and she no longer work's at Red 5 Tattoo. 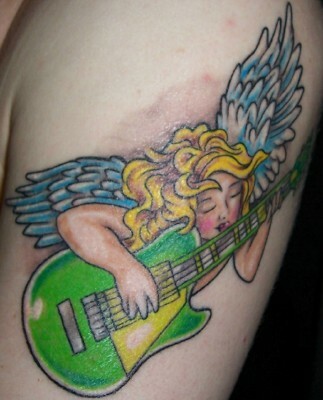 I did send a message to her to retrieve the name of the artist who inked this tattoo, but I never heard back. So it will have to stand alone. 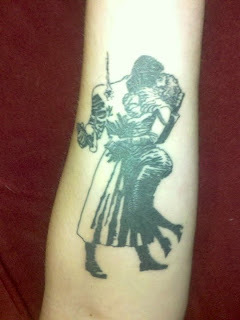 UPDATE: Red 5 informed me that the tattoo was done about 10 years ago by artist Chris Garcia (@ChrisGarciaTattoos). 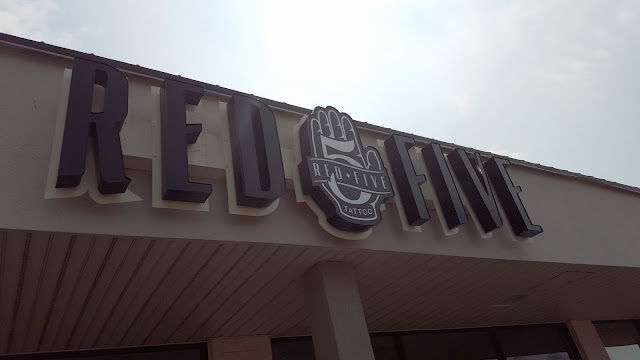 Check out some photos from Red 5 Tattoo below. Thanks to Alicia for sharing her awesome tattoo with us here on Tattoosday! Be sure to stop by Red 5 Tattoo if you’re ever in Virginia Beach! Website here. Mirko got this because he just loved the artwork. He credited artist Loco Dharma (@locodharma) from Dharma Tattoo (@dharmatattoostudio) in Miami. Thanks to Mirko for sharing this beautiful tattoo with us here on Tattoosday! Earlier this month, I met Sean outside of a store on Broadway in lower Manhattan. I generally don't like to post full sleeves on Tattoosday because it is, in my opinion, really hard to do them proper justice. Once in a while, however, the work is exceptional, and I can't help but try and capture some segments of the sleeve. Sean explained that segments of the sleeve are in memory of a neighbor who was a mother figure for him when growing up. 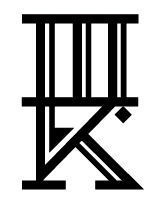 She succumbed to complications from lupus, and the clock and roman numerals link to the date of her death. We didn't have time to discuss all the elements of this sleeve, but he did credit the work to Tazz (@Tazz_Tatts) who works out of Aztec Ink (@aztecinkbrooklyn) in Sunset Park, Brooklyn. We've featured work by Tazz at least once before, like this piece which appeared in 2011. Thanks to Sean for sharing his cool sleeve with us here on Tattoosday! A couple years back, Heather shared an amazing tiger tattoo with us. She is the owner of Paws on Pine, a pet services company in lower Manhattan. 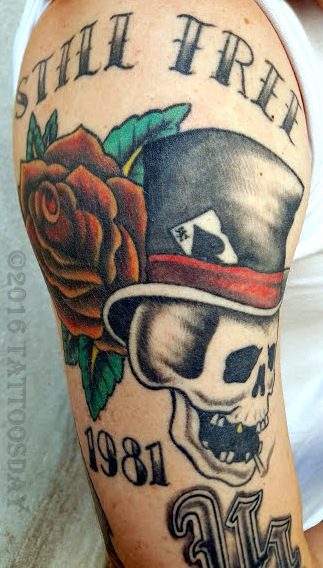 Heather told me she had this tattooed earlier this year, on April 9, by Jessica V (@jessicavtattoos) at Sacred Tattoo (@sacredtattooNYC) in Manhattan. 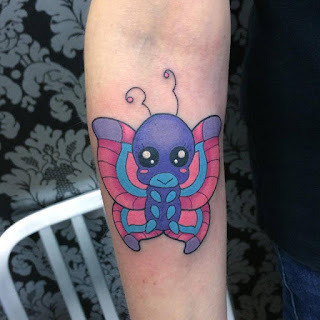 “What’s crazy about this is, I had the appointment all set for the 9th [of April] and then I wanted to get a butterfly because I wanted it to symbolize that I could go really high, sky high, but not too high. It keeps me grounded. But then my grandmother passed that morning. She was 90, so it’s for her, too." Here's another photo from Jessica V's instagram, identified as a "Kawaii Chibi Butterfly:"
Thanks to Heather for sharing her cool butterfly with us here on Tattoosday! That, of course, is Mr. Met, in the logo for the New York Metropolitans baseball team. Carl is a huge fan and wanted to wear his team loyalty. He's been a fan since he can remember and recalls that his father took him to his first baseball game. When I asked what he remembered from that first game, he noted that Joel Youngblood and Dave Kingman were playing. This was tattooed by Brooklyn's own Mr. Kaves from Brooklyn Made Tattoo in Bay Ridge. Thanks to Carl for sharing his cool tattoo with us here on Tattoosday! We talked about the two elements above in great detail. "The tattoo artist is out of Miami, Javier Betancourt (@JavierBetancourt) ... he was doing a week-long stay at Three Kings [in Brooklyn] ... my wife ... found him on Instagram ... I had this idea for something much more subtle, actually, it was just sort of going to be hinting that it was her, it was going to be more Sailor Jerry, or it was going to be a silhouette ... But then we saw his work and - it was the first time I'd seen somebody do [something] like a stylized caricature ... it's very statuesque, as opposed to, like, when you see people get portraits, it's like they're trying too hard to mimic the photograph, whereas he would just take certain accents from the photograph to make the image..."
Needless to say, Joel and his wife were very pleased with the end result. 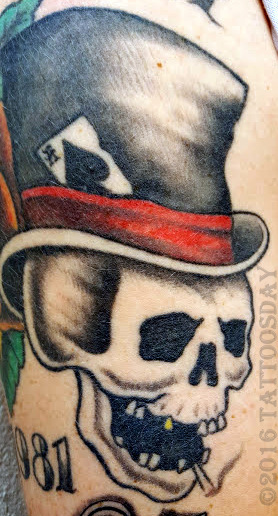 Directly above the image of his wife is a magnificent skull that spans the middle of his arm. The artist is Tamara Santibañez (@TamaraSantibanez) out of Saved Tattoo (@Saved_Tattoo) in Brooklyn. "I just came across her," Joel told me, "because I liked some of the work that I saw." Thanks to Joel for sharing some of his amazing tattoos with us here on Tattoosday! The first Sunday in June is the Fifth Avenue Festival in Bay Ridge and, over the years, it has been kind to Tattoosday. Dan explained that this phoenix represents "the woman I'm looking for ... independent ... [and] strong...". 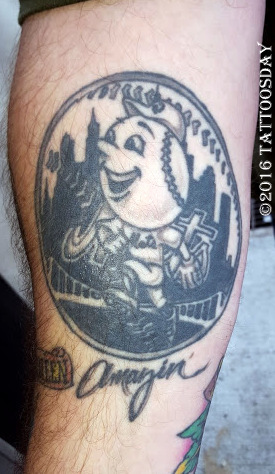 He credited this to local tattoo legend Michael Angelo in Bensonhurst, Brooklyn. Thanks to Dan for sharing this cool tattoo with us here on Tattoosday! 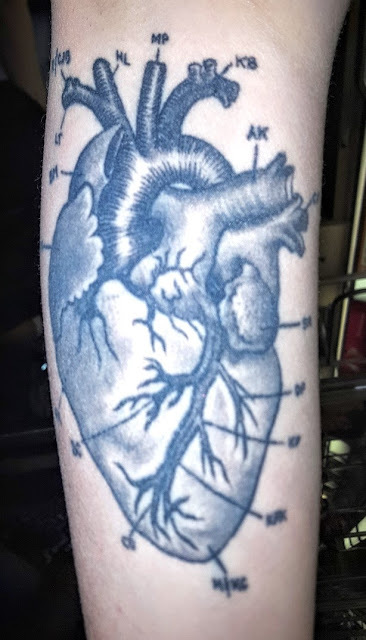 Last week I saw an incredible tattoo while walking on 5th Avenue in Bay Ridge, Brooklyn. "I was thinking about my ex-boyfriend because I loved him so much that I felt like I wanted to kill him every single day of my life. And then, after he passed away, I just thought that Love killed me ... Although I wanted to kill him with everything on my back, at the end of the day, love killed who I actually loved." 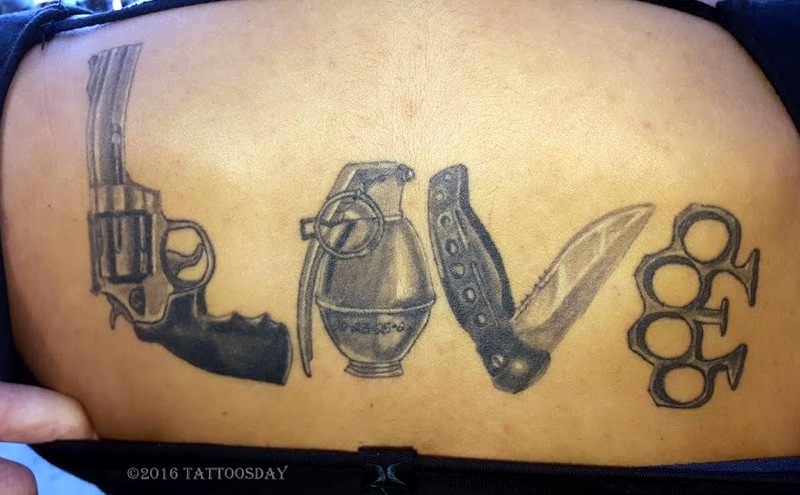 Deneene went to her artist, Jeanine at Liquid Expression Tattoos in south Brooklyn, and worked with her to transform the emotion into the final tattoo on her upper back, with LOVE spelled out in weapons. L is represented by a handgun, O by a hand grenade, V by a folded knife, and E by brass knuckles. 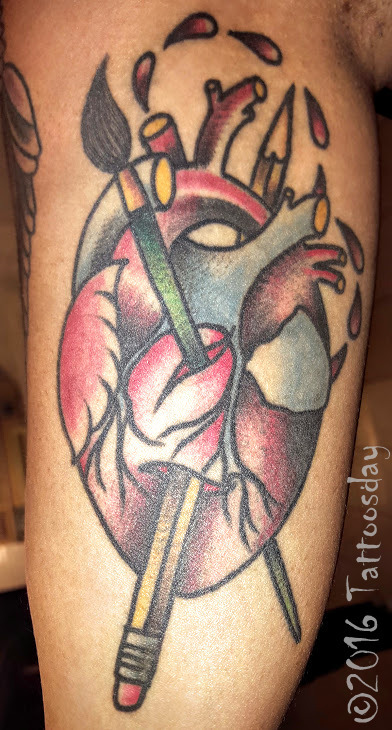 Thanks to Denenne for sharing her awesome tattoo with us here on Tattoosday! This is, of course, the penultimate line in Led Zeppelin's "Stairway to Heaven." "[There are] lots of reasons ... the short version, I guess ... obviously I love Led Zeppelin, rock and roll, but that moment of that song is one of the most powerful feelings that I would like to always feel." This was tattooed by Kevin Jang (@BlackFishTattoo) at Black Fish Tattoo on 32nd Street in Manhattan. Thanks to Monica for sharing this rocking tattoo with us here on Tattoosday! Last month I met Sebastian and Valeria, a couple visiting from Germany. Both had tattoos and both were kind enough to share their work with us. His artist that did this was Inri at Tattoos by Inri in Hanau. "For a few years, in my youth, I had a very wild time. I was close to going to jail. The tattoo artist was head of Hell's Angels. Hanau, He's a very cool guy." This was tattooed in the same shop, by another artist named Jochen. Danke schön to Sebastian and Valeria for sharing their tattoos with us here on Tattoosday!